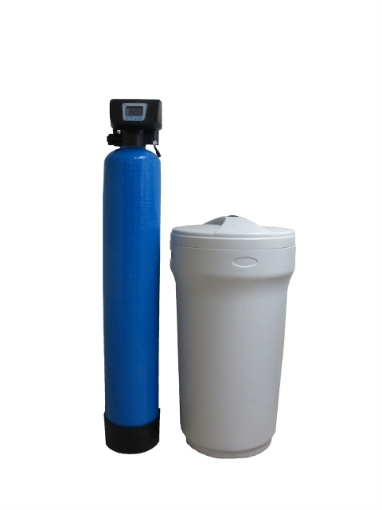 The Water softener is used to remove hardness (also known as calcium, lime, kalk) from the water. A water softener is an ion exchange system, which essentially means that it swaps one ion for another. In the case of water softener, it exchanges the hardness ions (calcium & magnesium) for sodium ions. The cation resin inside of the vessel is coated in sodium ions, as the water flows through the vessel the sodium ions exchange places with the hardness. So the hardness “sticks” to the cation resin inside of the vessel and the sodium ions continue on with the water. The water softener will then run regeneration cycle, where the hardness on the cation resin is flushed out of the unit, and the cation resin is then recoated with sodium ions. Salt is used during the regeneration process as a source of sodium ions, to flush off the hardness and re-coat the resin. There is a misbelieve that water softeners add salt to the water, however, this is not the case. A properly installed and functioning water softener should never make a water that does not already have a salty (brackish) taste suddenly taste salty. What size Softener should I get? While the softener does have a liter per hour flow rating, this is only meant as a guide and is for situations where the Hardness level is 300ppm or lower. The fact is that all the water softeners can handle similar flow rates, the difference will be with the effectiveness of the hardness removal and the regularity of the regeneration cycles at higher flow rates. The larger the water softener vessel, the more cation resin it will contain, the larger the amount of time before the resin becomes saturated and requires regeneration. In situations with very high hardness (kalk/lime) levels, it is recommended to go with the largest of the water softeners. Otherwise, with the smaller water softeners, you will regenerate on a very regular basis. All the smaller amount of cation surface area in the small water softeners means fewer places from hardness to be captured and so it will reduce the effectiveness of the softener. Please note that larger Softeners are available on request. Please contact us by email or phone to find out about larger water softeners. There are two models of Digital Automatic Valve Head we use with our water softener units, the F63B1 and F63B3. Please find below some videos on programming these two valve heads.